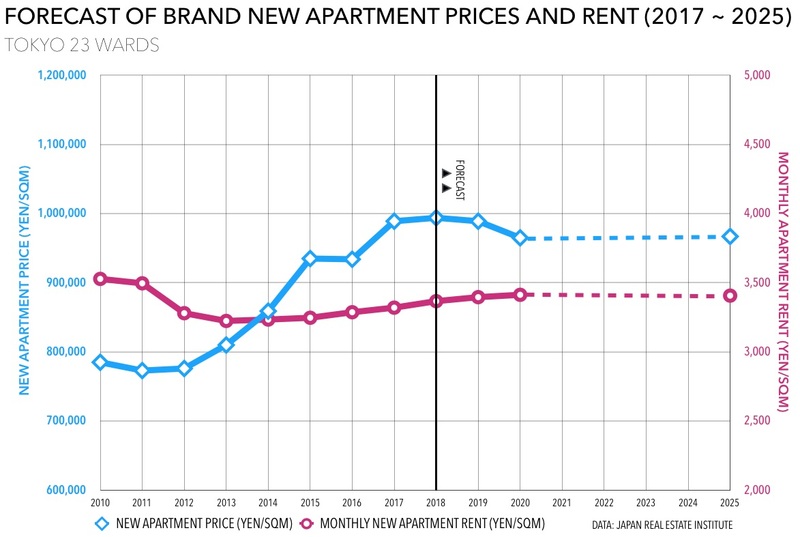 The Japan Real Estate Institute (JREI) has issued an updated medium-term forecast for the price of brand new apartments in Tokyo’s 23 wards over the next seven years. Price predictions have been revised updwards from last year’s forecast. In 2018, average new apartment prices are expected to be 994,000 Yen/sqm, up 0.5% from 2017 and 4.4% higher than their previous forecast. 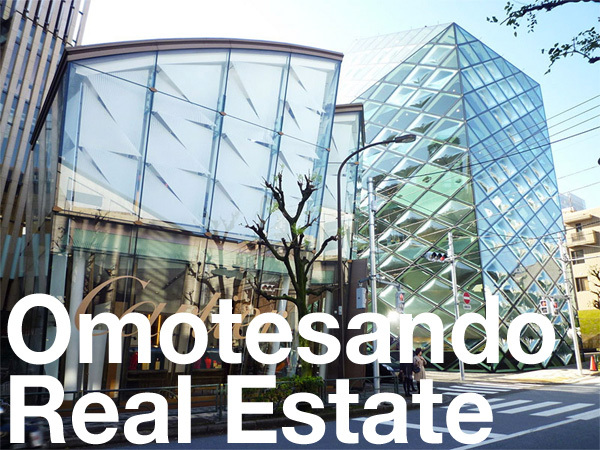 In top spot was the Motoazabu address in Minato Ward with an average apartment price of 2,133,000 Yen/sqm (1,855 USD/sq.ft). 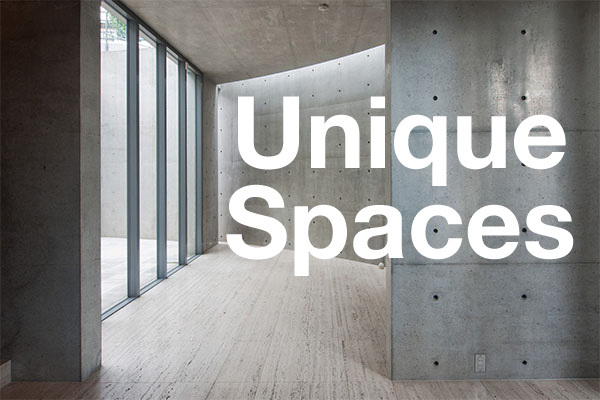 The most expensive apartment in this neighbourhood was 3,063,000 Yen/sqm and the cheapest was 1,093,000 Yen/sqm. 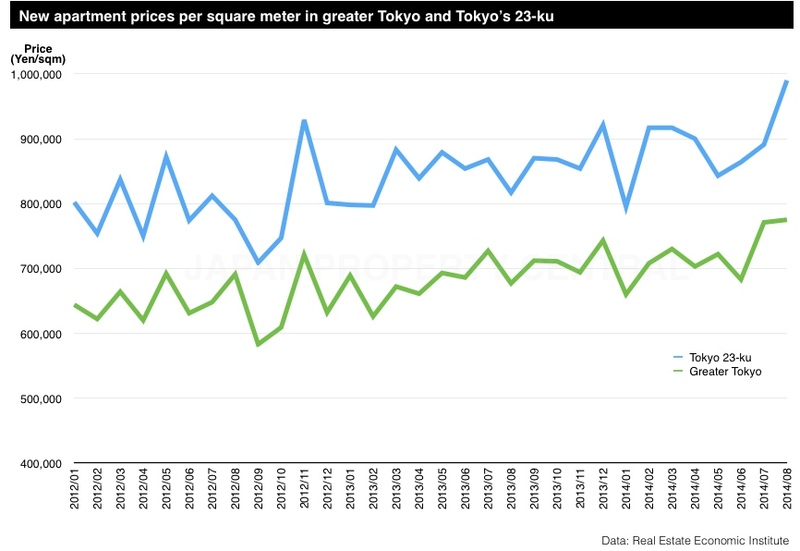 According to Tokyo Kantei, the half-yearly rate of growth in the price of second-hand apartments in Tokyo has slowed in the first half of 2016 after seeing strong and likely unsustainable gains over the past three years. 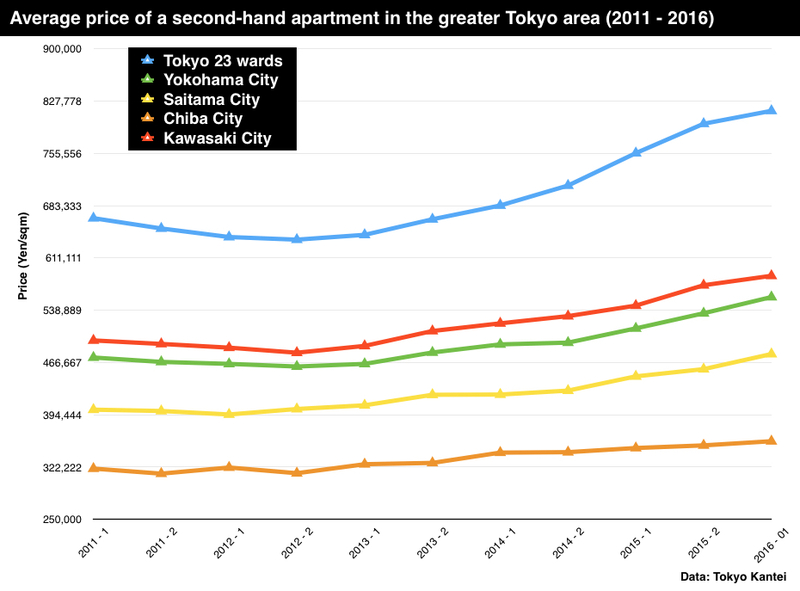 Second-hand apartment prices in central Tokyo have increased by 32.7% from the bottom seen in the second half of 2012, and are up 6.1% from the first half of 2015. However, prices have only increased by 0.06% between the second half of 2015 and the first half of 2016. According to Tokyo Kantei, the average asking price of a 70 sqm (753 sq.ft) second-hand apartment in greater Tokyo in September was 31,590,000 Yen, up 1.4% from the previous month and up 11.9% from last year. This is the 13th month in a row to see an increase. The average building age was 22.4 years. In Tokyo’s 23 wards, the average asking price was 49,130,000 Yen, up 1.0% from the previous month and up 16.5% from last year. This is the 15th month in a row to see an increase in prices. The average building age was 22.2 years. 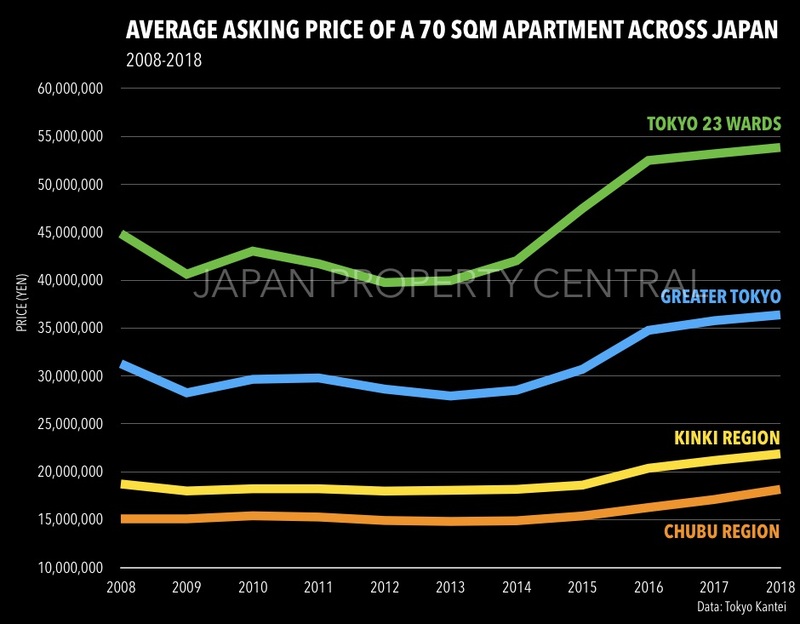 In Tokyo’s central six wards (Chiyoda, Chuo, Minato, Shinjuku, Bunkyo and Shibuya), the average asking price was 69,210,000 Yen, up 1.3% from the previous month and up 17.0% from last year. The average building age was 20.6 years. According to Tokyo Kantei, the average asking price of a 70 sqm (753 sq ft) apartment in greater Tokyo in May was 29,980,000 Yen, up 1.0% from the previous month and up 5.5% from last year. This is the 9th month in a row to see an increase from the previous month. The average building age was 22.0 years. The increasing cost of buying a brand new apartment is causing buyers to shift their attention to the resale market. With the average price of a new apartment over 10 times the average annual income, and far exceeding the normal multiple of 6, more and more buyers are becoming priced out of the new apartment market. 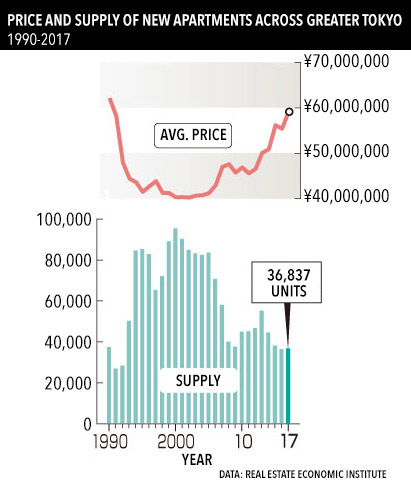 According to REINS, 2,440 second-hand apartments were sold across greater Tokyo in January 2015, down 2.3% from the previous month and down 9.2% from last year. This is the 10th month in a row to see a year-on-year decline. The average apartment sale price was 27,980,000 Yen, down 1.7% from the previous month but up 4.7% from last year. The average price per square meter was 437,300 Yen, down 2.6% from the previous month but up 5.3% from last year. The average building age was 19.51 years. 1,193 second-hand apartments were sold in the Tokyo metropolitan area, down 4.6% from the previous month and down 9.3% from last year. The average sale price was 33,220,000 Yen, down 5.3% from the previous month but up 1.3% from last year. The average price per square meter was 567,600 Yen, down 4.4% from the previous month but up 4.1% from last year. The average building age was 18.89 years. In central Tokyo’s 3 wards (Chiyoda, Chuo and Minato), the average sale price was 48,030,000 Yen, down 16.2% from the previous month and down 1.4% from last year. The average size of an apartment sold in January shrunk by 10.3% from the month before, while the average building age was 4 years older, which may help explain the fairly large drop in price from the previous month. The average sale price per square meter was 933,000 Yen, down 6.6% from the previous month but up 6.9% from last year. For the first time in three years, the average asking price of a secondhand apartment in greater Tokyo has increased from the previous year. 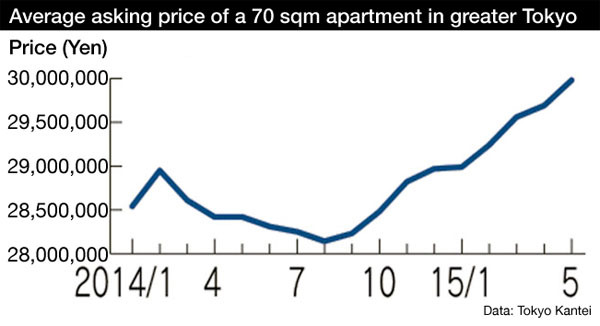 According to Tokyo Kantei, the average asking price of a 70 sqm (753 sqft) second-hand apartment in greater Tokyo in 2014 was 28,510,000 Yen, up 2.1% from 2013. 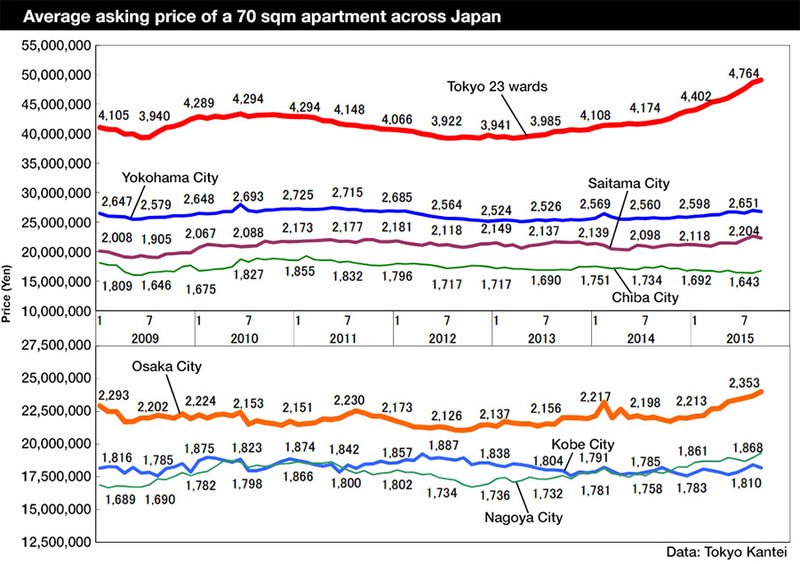 In Tokyo’s 23-ku, the average price in 2014 was 42,030,000 Yen, up 5.2% from 2013. It is now 6.3% below the peak seen during the last mini-bubble in 2008. The average asking price in Tokyo’s 23 wards was 43,790,000 Yen in December, up 1.1% from the previous month and up 7.7% from December 2013. The average building age was 22.2 years. In central Tokyo’s six wards (Chiyoda, Chuo, Minato, Shinjuku, Bunkyo and Shibuya), the average apartment asking price was 61,970,000 Yen, up 1.1% from the previous month and up 12.8% from the previous year. The average building age was 21.4 years. The average price across greater Tokyo was 29,870,000 Yen in December, up 0.5% from the previous month and up 2.3% from the previous year.